Designation will include class of vehicle and, if appropriate, time of year for motor vehicle use. 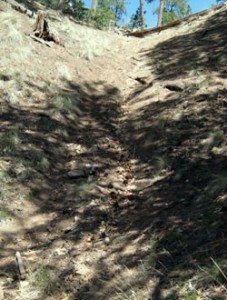 A given route, for example, could be designated for use by motorcycles, ATVs, or street-legal vehicles. Once designation is complete, the rule will prohibit motor vehicle use off the designated system or inconsistent with the designations. Designations will be shown on a motor vehicle use map. Use inconsistent with the designations will be prohibited. Travel Management Planning has been in process for a long time and we have asked you to make comments at critical points. We joined with other conservaton organizations to provide extensive comments on the plans. Travel Management for the Apache-Sitgreaves was ready to implement last summer. The Wallow Fire raged through the forest just before this implementation. Since then, Travel Management has been on hold. 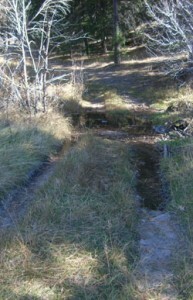 Paddy Creek and Little Creek: Two drainages included in our citizen’s wilderness proposal. Antenna Ridge Drainage and Rogers Reservoir: Two fragile riparian areas. You have made a difference in the plan by all of your letters and comments! Together we will strive for the best possible management plan for the Apache-Sitgreaves.